I’ve always imagined that making jam or putting up things required whole days standing over a hot stove stirring and stirring, sweat dripping off my nose, jars everywhere, fruit juice staining the walls. As canning and jam making has gotten more popular in this DIY decade, more and more books appear on the market. Many are nice and instructive, but I couldn’t get past what I imagined it would entail. That is, until I tried the simple strawberry jam recipes in Kevin West’s Saving the Season. The whole process took only an hour and we ended up with 4 half pint jars of the most amazing jam. We kept going. So far we’ve made spicy agrodolce onions, Maraschino cherries with fruit that we foraged from the parking lot of a Valvoline near our house, the most delicious sour pickles ever, blueberry jam with gin, and last night, Methley plum jam with star anise. The last one was really a riff off of a recipe he had, but not quite the same. 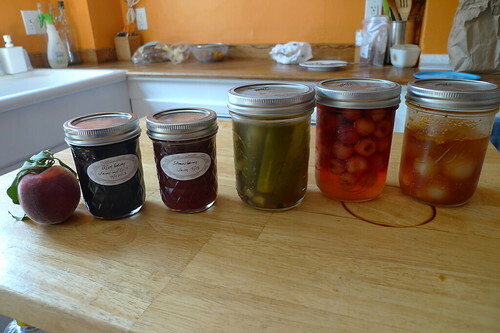 I’ve gotten so confident now that I want to make jam or pickle out of everything I find at the farmers’ market. My favorite part of the book isn’t the recipes. It’s the approachable, extensive text that West includes. There are plenty of beautiful pictures of food, of course, but they’re matched with tons of stories and poems that you don’t find in other cookbooks. You get tales of his family making jam, the history of the preserving pan, and cocktails you’ll want to make instantly, plus charts and graphs about every fruit or vegetable you can think of preserving. This entry was posted in Book Reviews, Food on July 23, 2013 by bookdwarf.